My first impression when listening to bassist Alexander Frangenheim's music was that he actually used notes like a sculpture uses matter, whether wood or stone, because he not only shows the most incredible respect for the tones he produces, but then he bends and shapes them based on how they present themselves, based on their instrinsic value and color. It is only after listening to this album that I read that he actually is a sculpture as well as a classically trained double bass player. 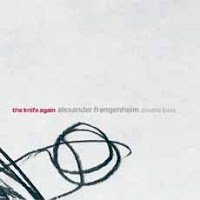 In seventeen relatively short tracks, Frangenheim builds his aesthetic, mostly by bowing, making his bass sing and grunt and scream and shout and whisper, sometimes with sparse sounds, as on "The Plains", or with unrelenting intensity, as on "Counter", but as said, it is more a demonstration of the beauty of the sound material, their sensitivity to the touch, the physicality of the resonance and the vibration of the strings under the pressure of the bow, the deep tones arising from the wood, the power of hard plucking: it is all so physical and intimate at the same time. Don't expect long epic developments, but listen to the struggle between man and instrument between material and shape, between the inside of the artist and the inside of the instrument. Hello! The Montreal Jazz Festival web team really enjoys the reading of your blog. Great content! Where can I find his recordings?